Chef is a character in the HD Universe who appears as a minor character in Grand Theft Auto V and Grand Theft Auto Online. His voice actor is not credited. Chef joined Trevor Philips at some point prior to 2013 and during a "job interview" was told by Trevor to steal money from a "cash for gold" man in Sandy Shores. The man and his bodyguards were killed and what remained of their bodies was buried in a junkyard. The job earned the two $50,000. Chef then began working for Trevor, cooking methamphetamine at the Liquor Ace store in Sandy Shores and, in early 2013, unsuccessfully attempts to stop an unnamed assailant from stealing a van of methamphetamine. Later in the year, he and Trevor repel an attack from the Los Varrios Aztecas while attempting to show Tao Cheng and his translator their operation. Chef can, if chosen by Michael De Santa, also accompany Trevor, Michael and Franklin Clinton on two other heists. 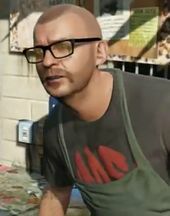 Chef can be killed in the Meth'd Up mission in Grand Theft Auto Online despite the games events taking place before those of Grand Theft Auto V where he makes at least one appearance. Chef can be found after the storyline, standing at a window and smoking in the meth lab at the Liquor Ace store. He can be killed, but he will always respawn; he cannot be interacted with as he never responds to any protagonist. This page was last modified on 6 April 2014, at 12:22.